Today I’m launching the first post in each of two new series over on Grad Student Finances. The first post in the side job series is from a student who worked part-time for an investor relations firm. The first post in the reader posts series is on why one grad student is motivated to save aggressively. I didn’t quite know it at the time, but last fall, just after my PhD defense, I started a business teaching early-career PhDs about personal finance. (Well, for a related endeavor, I suppose you can trace my entrepreneurship to when Kyle and I started EPF.) During my funemployment, I developed my first product, a live presentation, which I sold for the first time this past spring. I worked on my business on the side while I was doing my fellowship in DC this past spring, but starting in mid-April I officially became full-time self-employed. I’m currently 1) pitching my live presentations (I’m up to four now, with two more to develop this summer) to universities and 2) developing products that I can sell directly to grad students and postdocs. So far, no money is coming in from this endeavor because I’m asking for fall bookings and my products are not finished, but with every week that goes by I’m growing more confident that this business can be my full-time endeavor for a while. Based on my experience pitching schools last spring, I have improved my initial cold email, created a clear flyer, and now funnel potential customers into phone and video calls instead of relying on email communication. All of this is resulting in a much higher ‘hit rate’ of interested groups (even after I tell them my speaking fee) than I had last spring. My goal is to have enough fall bookings by the time we move to ensure that I can keep at this full-time – if not, I’ll get a job and keep my business going on the side. Other than the business-specific goings-on, I’m finding that I’m really taking to entrepreneurship/self-employment. I got an inkling of some of these traits last fall when I was funemployed, but now that I am more focused on building my business I can see clearly that – subject matter aside – grad school actually prepared me well for being a solopreneur. My dissertation project was quite solitary by the end of grad school. I had my advisor, of course, but he was pretty hands-off; a couple of my labmates did similar work, but I only occasionally consulted with them; I really only ever took meetings with my collaborators, only rarely directly producing work side-by-side; I enjoyed being around my officemates, but we never worked together directly. My work might have been on the solitary side of the spectrum of lab-based PhDs, but as the purpose of the degree is to develop independent researchers, I think doing quite a bit of solitary work is typical. By solitary I don’t just mean working alone, although I did (even with other people around), but directing my own work. Over the years I really did develop project management skills that allowed me a large degree of independence from my advisor and other mentors in the lab. As far as people go, I only had myself to manage, plus the undergrad I mentored in my last year and my relationship with my advisor, but I had a few projects to juggle at once and of course many aspects of each project. As an entrepreneur, I really am completely on my own in terms of the responsibility for my business, though of course Kyle is a supportive spouse and I’ve made some effort to connect with potential mentors (not enough!). But directing my own work day-to-day, month-to-month, and year-to-year – and working totally by myself, except for communicating with customers – feels very familiar to me, having done that throughout much of my PhD. One of the few upsides to grad school was the personalized schedule I was able to keep. I know not all grad students experience this, but for most of grad school I was able to work approximately 10 AM – 6 PM hours, plus a bit on most weekends and some evenings. (That was really my choice as my boss was not directive on this matter – some of my labmates worked strictly 9 AM – 5 PM, some worked afternoons and evenings, and one kept a reverse schedule.) Vacation, daytime appointments, working from home or the library – this was all up to me to manage. Grad school was a step in the direction of schedule freedom; even though I could technically keep whatever hours I wanted, I still wanted to be around my office and the lab during typical academic work hours to interact with my advisor and labmates. With entrepreneurship, I’ve taken a further step. I now have nothing tethering me to other people’s schedules except Kyle’s work hours and whatever calls I might arrange with potential customers. I know that some solopreneurs struggle with their newfound schedule freedom (as nice as it is), but I’ve adapted pretty well. I work for most of the day while Kyle is at work, also fitting in my meals and perhaps some chores. I work more in the evenings and on weekends than I used to, but I enjoy it. I’ve been tracking my time so I know I’ve been working at least 40 hours per week, even though the blocks of time are a bit more interrupted than they used to be. I’m certainly exercising the self-discipline that I cultivated during grad school. This perhaps isn’t too different than most salaried jobs, but work both in grad school and in my business ebbs and flows a bit and I have to go with it. In grad school I certainly worked harder up to deadlines such as application submissions, lab meetings, and conferences, and the Big Kahuna, my dissertation submission and defense date. Certainly a ‘working hard’ period for me recently in my business was when I was working on it in the evenings during my fellowship – a full-time job plus an almost-megacommute took a lot out of me, but I still found 10-20 hours per week to put into the business. The week leading up to giving a presentation is also quite busy as I am rehearsing and refining. I’ve been ‘training’ for this kind of cycle my whole life as a student, though I hope I can make it a smoother ride for myself. Kyle and I also learned to prioritize our work-life balance in grad school – an experience perhaps not shared by most grad students. We worked really hard in undergrad and had no intention of keeping up that pace for another 7 years. So instead of our life being 100% grad school, we intentionally cultivated outside activities and interests. Those activities are great for me now, as they are an appreciated forced break from working and an opportunity to see other people. Honestly, I’m enjoying my work (still feels like funemployment!) so much that I don’t have a desire for strong boundaries right now – maybe that will come with time. Engaging in a research project is often a story of repeated failure – if you want to define it that way. In my six years in grad school I experienced frustrations, setbacks, stalls, rabbit holes, rejections, breakdowns, disappointments… over and over and over. In fact, for about two years it seemed that nothing whatsoever was working with my project, until I had one small success, which snowballed into more frequent successes, though they were still interspersed with many failures. Even in the end, my project was only partially successful, but I guess that part was enough to graduate. My point here is that, if nothing else, grad school trained me to persist in the face of long-term ‘failure,’ and to realize that a ‘failure’ state is likely not permanent and something will come of it. I wouldn’t necessarily use the word ‘failure’ to describe my business ventures so far – I really haven’t been at it that long, in the scheme of thing – but there have certainly been rabbit holes as I’ve discovered what I can offer that the world (probably?) wants and disappointments. My talk proposals have been rejected many times through email and over the phone, and once a potential client laughed in my face when I named my desired speaking fee! But as I said in my update above, it seems like these days the tide is turning toward more frequent successes so I’m just going to feed off that and keep at it. As I said, I’m not bringing in any money from my business right now, only from my contract work, so Kyle and I are living off his income, my small side income, and our savings. Strangely, having a low income all through graduate school also prepared me well for being an entrepreneur. We have low-ish baseline costs, which means that I do have the flexibility to not earn any significant salary for a while. If I tried this entrepreneurship thing after we had adjusted to me having a real-job salary we would be in for a much ruder awakening than we have been. So that is a silver lining to being paid a stipend instead of a real salary! Writing and public speaking, which is the bread and butter of what I do in my business, are actually not skills I improved while I was in graduate school. I honestly think my writing and speaking skills atrophied during my PhD. I’m not even sure I improved at scientific writing and speaking because the standards are so low in academia (in my observation). Thankfully, I had really great teaching and practice in those subject areas in college, and I think it’s all coming back to me (or my audience also has low standards!). After reflecting on my identity shift from ‘scientist’ to ‘entrepreneur,’ I actually don’t think the change is too out there/crazy in terms of the skills I developed during grad school! Time will tell if I persist in this solopreneur identity, but I think my PhD is giving me a good start. Have you ever had seemingly unrelated life experience prepare you well for something? What did you learn while you were in school aside from the subjects you studied? What is/would be your favorite aspect of entrepreneurship? 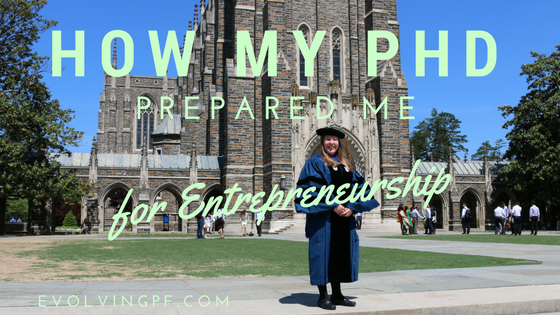 6 Responses to "How My PhD Prepared Me for Entrepreneurship"
You’re already started on the entrepreneurship part, though! Perhaps the similarities will work in reverse for you.